Okay time for some in ring action with the wrestlers of the WWF. I pick the oh so cool Macho Man Randy Savage. I start off on medium difficulty and go into the a regular match. I'm wrestling against Sid Justice...and I mop the floor with him. Its been almost a decade or so since I lasted played the game...hmm better bump it up a notch and contend with hard difficulty. So this time around I pick the Undertaker and take him through the tournament mode on hard. I make it to the second last match before the computer gets cheap and almost hands me my first loss. But I eventually turn it around on him and swiftly beat him up. Its a shame that each wrestler uses the same moves. On top of that you don't get any finishing moves either. Bah! So in this go around you get a total of 6 different wrestlers to choose from (you only get 5 in the first Superstars game) with regular match, tag-team match, steel cage match and a tournament mode to compete for the title. 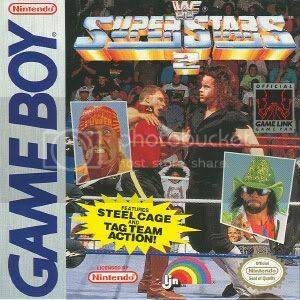 One of the better wrestling games on the GB. Pros: More wrestlers than the previous installment, various modes a plus, second wind feature is great. Cons: Not too difficult even on the hardest setting, lack of variety in maneuvers, not as nice looking as Superstars 1, no trash talking before the match like the previous game. Its one of the better wrestling games on the GB, but I would still take a pass on this one.